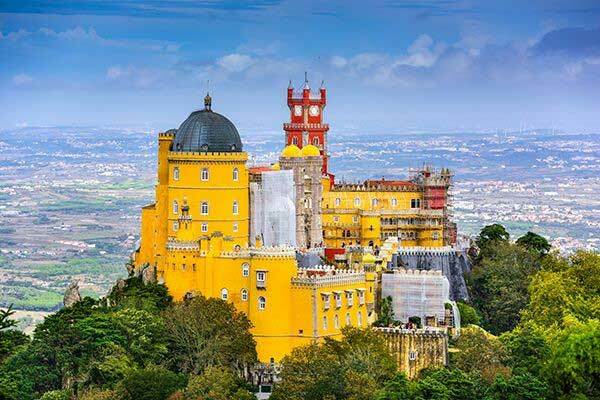 A glorious example of 19th century Romanesque Revival architecture, the Palace of Pena is recognizable for miles due to its location on one of the highest points in Sintra and its vivid colors. The UNESCO World Heritage site is the creation of King Ferdinand II. Viennese by birth, king by virtue of his marriage to Maria II of Portugal, he didn’t leave his ancestry behind in designing the palace; it’s an ideal setting for a Grimm fairy tale. A note on visiting hours and ticket prices: Closing times are generally earlier in winter, so please check with the park when visiting. Costs vary. For instance, the Capuchin Monastery is half the price of Pena Palace. In general, children and senior prices are one to two dollars less than full adult ticket prices. If you plan on seeing many places, check out discount passes here: https://www.parquesdesintra.pt/en/commercial-area/ticket-office-2/. The National Palace has its origins in the 8th century at the beginning of the Moorish occupation. Its look today, however, is the result of extensive building during the 15th and early 16th centuries. In fact, it’s the best-preserved medieval royal residence in all of Portugal, inhabited almost continuously from the early 15th through the late 19th centuries. Stroll the interior courtyards and hear legends of the past, like the intriguing story of how the Magpie Room received its name. 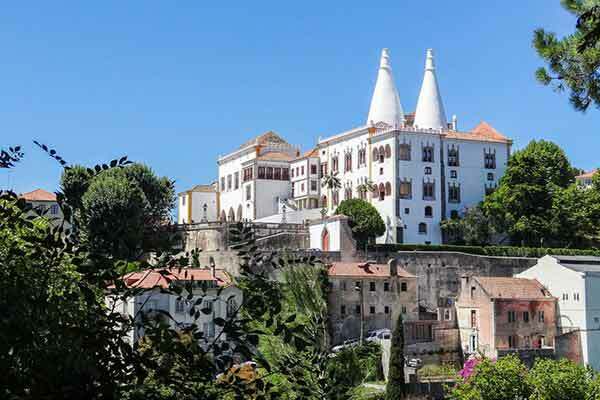 Note: If you’re thinking about spending more than a day in town, walk three minutes from the palace to the ideally located four-star Sintra Boutique Hotel and check availability. A room with free wi-fi and breakfast for two runs $138 and up. During the 8th and 9th centuries, the Moors built a fortification in Sintra. It was surrendered to Christian forces in 1147, and over the centuries was remodeled and expanded. Today it offers tourists panoramic views of Sintra; on a clear day you can see Mafra, site of another major national palace. Monserrate Palace is an exotic villa dating from 1858. A former summer resort of the Portuguese court, the mansion exhibits Anglo-Saxon, Moorish, and Indian influences. Another UNESCO World Heritage site, the palace is remarkable for its eclectic gardens featuring plant species from five continents as well as lakes and waterfalls. One attraction many visitors overlook, but well worth the time, is the Capuchin Monastery. Known as “the cork monastery” (its only decoration), it’s set amid pine trees and boulders, isolated and austere, with living quarters and kitchens connected by narrow stone passages. A fascinating look at the life of Franciscan monks who made it their home, so close to—and in contrast to—the opulent way of royalty in nearby palaces. Another less well-known attraction is the Cottage of Countess Edla. After the death of his wife Dona Maria II, King Fernando II married the Countess of Edla. Unlike the imposing Pena Palace, this time he built a charming and romantic two-story Alpine chalet, a fashionable trend in late 19th century Europe. Features include stone walls designed to look like wood, murals, glazed tiles, and extensive use of cork on bays, eaves, and balconies. The setting includes lakes and a garden featuring both local vegetation and species from around the world. Pastelaria Gregório is one of Sintra’s oldest pastry shops. Try a queijada (like a small cheesecake) or one of their famous honey cakes. For a quick bite between castle visits, skip the tourist restaurants and stop into a local bar. Located on a side street near the tourist office, Bar Estrada Velha is inexpensive and cozy, with a few tables for outside seating. We like the ham and cheese crêpes served with a side salad of tomato, lettuce, and fresh onions. One of our favorite dinner spots is family-owned Cantinho de São Pedro. One of the oldest restaurants in Sintra, it offers not only Portuguese cuisine, but items like moussaka ($10) and cannelloni ($8.50). Top off your dinner with profiteroles ($4). Dating from 1764, this is the oldest hotel on the Iberian Peninsula. 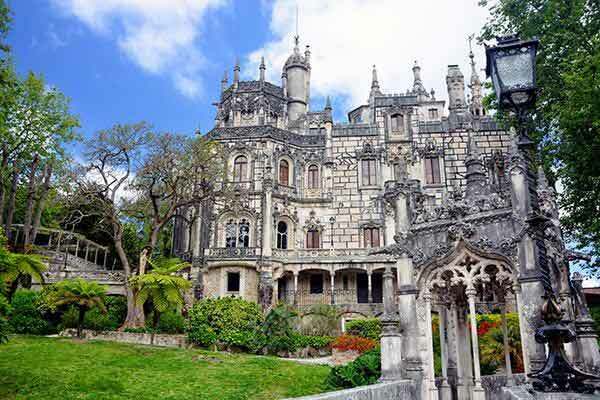 A six-minute walk to the National Palace and eight minutes to Quinta da Regaleira. Around $200 per night. Charming venue close to the train station. A fifteen-minute walk to Old Town. From $87. Also near the train station, recently refurbished rooms, helpful staff, breakfast buffet. From $93. Five-star 18th century hotel. Tennis, pool, equestrian center, fine dining. $350-$450 and up. Finally, before you leave Sintra, head to the Sabuga Fountain on Rua Marechal Saldanha. Legend has it that drinking from it will ensure your return someday.